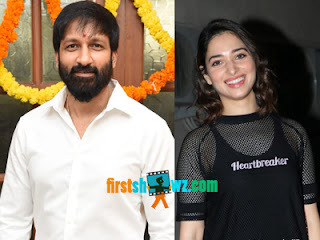 Home / News / Gopichand, Tamanna to pair up? Gopichand, Tamanna to pair up? Gopichand is looking to score a hit from past year, and he is keen to put an end to the flop streak. The actor has become choosy about scripts and is busy in setting up an interesting lineup to be back in the game. Gopichand for now is busy with the shooting schedules of his next film, an action entertainer to be directed by Tamil filmmaker Thiru. The unit has headed to 45 day long schedule in Rajasthan. Gopichand will be seen in a new and stylish look in this movie that will be produced by Anil Sunkara on AK Entertainments banner. Tamanna is being considered as the leading lady in the movie, and the actress is positive about the film, though she is yet to give her final nod. Vishal Chandra Sekhar is the music director of the movie.